You cannot know with what life-sapping weariness it must be reported that the Bishop of London (acting), the Rt Rev’d Pete Broadbent, blames “right wing headbangers” for the “disasters” of Brexit and the outcome of the General Election (ie a Conservative government supported by those ultra-ultra-ultra headbangers the DUP). It doesn’t seem to occur to him that these outcomes were a direct result of the democratic process: a majority of the electorate voted to leave the EU in a referendum, and the General Election gave Conservatives the most votes and the most seats in Parliament. Why should these be “disasters”? Perhaps it would be better if the people were never consulted on anything important, and this sort of complicated stuff were just left to those who know what’s best for us – bishops, perhaps, or judges. Or maybe both. Bishop Pete is, of course, well known for tactlessly speaking his mind, but his perpetual conflation of ‘right wing’ with intellectual deficiency, moral illegitimacy, religious hypocrisy and spiritual superficiality is not what one would expect from a Church of England bishop, especially one who happens to be the Bishop of London (acting). Does he not demean his ministry and bring the church into disrepute by caricaturing patriotic Britons as political headbangers and hard-right extremists? Pete Broadbent’s broad church is bent towards extending a welcome to all-and-sundry without discrimination, but if you happen to be a Brexit-supporting Tory, his church isn’t for you. And if you’re a Kipper, well, it were better you hadn’t been born. The fewer right-wing headbangers there are in the world, the less likelihood there is of disaster. And then good socialists like Bishop Pete can be free to get on with the important stuff of life such as pursuing social justice and the Common Good, to which right-wing headbangers (or, indeed, the right wing generally) have nothing much to contribute at all. Since when was Santa-Clause(4)-socialism a “new politics”? Corbyn gives the Church confidence? Funny, isn’t it, how bishops propagate the lie that Brexit means the cessation of all European cooperation and the termination of national well-being. What Brexiteer ever advocated global isolation, European insularity or neighbourly antagonism? What Brexiteer has ever proposed the end of liberalism and the Enlightenment? Has any CofE bishop ever welcomed the prospect of a Conservative government? Have any lauded a Tory leader for their positive vision as a force for good and an agent of inspiration? What is it that compels leaders of the Established Church of England to patronise, revile, berate and alienate those on the political right? Why is Brexit a disaster? Why should the return of a Conservative government be a disaster? What kind of theological wisdom is it which discerns catastrophe in every democratic decision which fails to cohere with personal political bias? What kind of bishop is it who has weeks and months for left-wing lepers and progressive prostitutes, but not a minute for moral, loyal and faithful right-wing headbangers? Perhaps they worship a different a god, and it’s a god that has no place for ‘the other’. 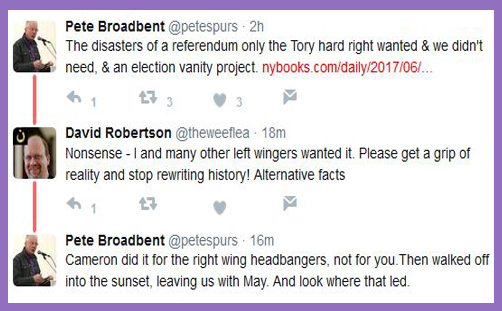 Feel free to appropriate ‘they’ and apportion ‘the other’ to whichever side you prefer, and let it become your via media prayer, for Pete Broadbent’s political fanaticism is really no different from that of the right-wing headbangers: it’s just the other side of the same coin. The problem is that his episcopal fault-finding and finger-pointing pours gallons of milk into a very small cup, and some of us like our tea a little stronger.